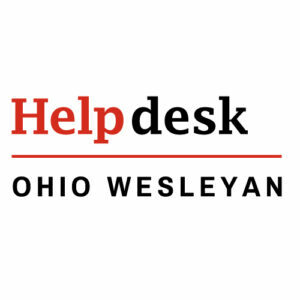 In November 2010 Google opened the flood gates to nearly all of their web applications (like AdSense, Blogger, Picassa, Reader, Scholar, and YouTube) to Google Apps for Education users, such as Ohio Wesleyan University. Information Services made the transition to new account infrastructure to make these services available in January 2011. 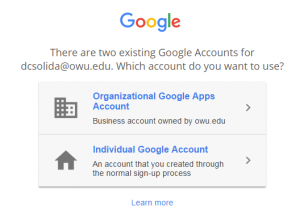 Here you will find information on this transition and instructions on how to migrate your data from a personal Google account to your OWU BishopApps account. Here is the announcement from the Google blog. Select On, then click/check the following checkboxes to confirm that you understand how to use multiple sign-in. 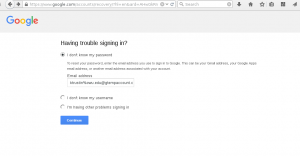 You may need to sign out of all of your accounts before it will take effect. Sign in to a product that supports multiple sign-in, using an account that has multiple sign-in enabled. Click your email address in the top-right corner of the page to expand the drop-down menu. Select Sign in to another account. In addition, you can find more information here. Why do I have two existing Google accounts? No notice will be sent to users, but the next time they go to sign in to a browser that doesn’t remember them (where they haven’t clicked the ‘Stay signed in’ box when entering their password) they’ll get the notice. 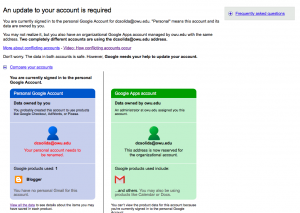 We have no way to find out which users in our domain have conflicting accounts, but Google has instructions posted (pretty much the same as they were 5 years ago) and should be simple to follow. Will any of my Docs, Sheets, Calendars, or other data be preserved when my OWU BishopApps account is deleted? The deleted user will no longer be able to sign in to BishopApps. Any existing mail and chat messages in the user’s account will be lost. Groups: A group created by a deleted user does not ever get deleted automatically. Information Services can see/manage all groups. Docs: When a user is deleted, all docs created by this user will be deleted as well. There is no fixed time for this. Typically, docs disappear after five days. However, sometimes they may be available for a slightly longer period of time depending on when the purge task executes. The best practice is to reassign ownership of important docs before account deletion. Sites: Sites that were created by a deleted user do not get deleted. All sites stay unless they are explicitly deleted. Information Services can access all sites in BishopApps regardless of the share/visibility settings. Calendar: The user’s primary calendar will be deleted but events created by the user will not. Secondary calendars created by a deleted user do not get deleted. However, if others in the domain want to be able to manage these calendars they must be given ownership before the calendar is deleted. Blogger: All blogs owned by the user will be deleted when the user account is deleted.